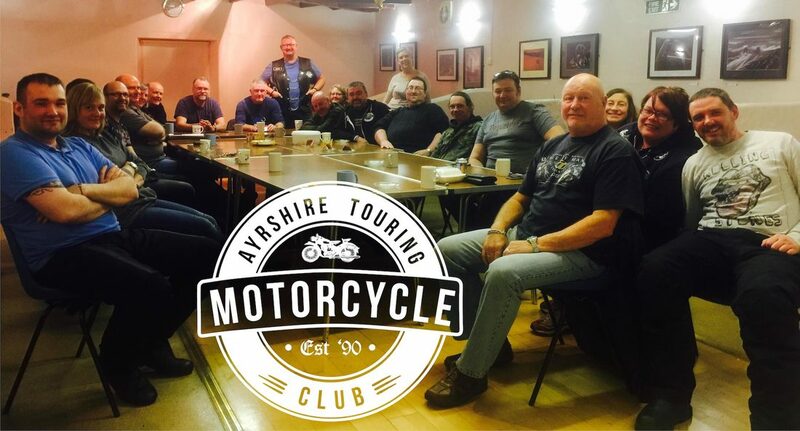 Ayrshire Touring Motorcycle Club were founded in 1990 and continually meet up every first and third Wednesday of every month at Townend Community Centre, Dreghorn, Ayrshire. When you join ATMCC you are automatically subscribed to our newsletter mailing list. It is sent out via email regularly and is full of upcoming runs, events, trips, routes we have planned, days out, weekends away, meeting dates, news and reviews of our past events. If you have any dates, information, notifications, events or invitations you would like to be included in the newsletter please email the editor directly here. Members can also contribute with run reports. Click here to see events, trips and runs we have planned. These vary from day trips, weekends away, to international events, for example the North West 200, and social events we host on the 5th weeks. If you are considering joining the club or coming along on one of our trips, pop into one of our meetings and introduce yourself or you can email us to let us know you are joining in one our runs and we will accommodate for you. We meet every first and third Wednesday at Dreghorn Community Centre near Irvine at 7.30pm until around 9pm, all year round. Some month's there is a fifth Wednesday and we use one day or night this week as a social event where we host seasonal events like Burn's Nights, Awards Shows, Pool Competitions, Rock Nights, Club Quizzes, etc. If you are interested in coming along drop us an email so we can arrange an extra cuppa. If you have any questions or queries just send an email and we usually reply quite quickly. Otherwise you can check out our Facebook page, it's updated regularly and we reply quite quickly. You can also pop into one of our club meetings for a cuppa and some right good banter about bikes, routes, where we have been, what we are planning on going aswell as the occasional help regarding mechanics.